This particular nail art is for my friend, Rachelle. I met her just last year. We were both taking an internet marketing class. It was not hard to get along with her. She was very friendly and approachable. One thing you will love about Rachelle is her smile. She never rans out of it and she is definitely the most cheerful person I know. She recently started a blog called Memos from the Purple Couch with an inspiring tagline -- Can we laugh our way to becoming an empire? She has proclaimed herself CEO, Cheer Executive Officer and everyone agrees it fits her perfectly. 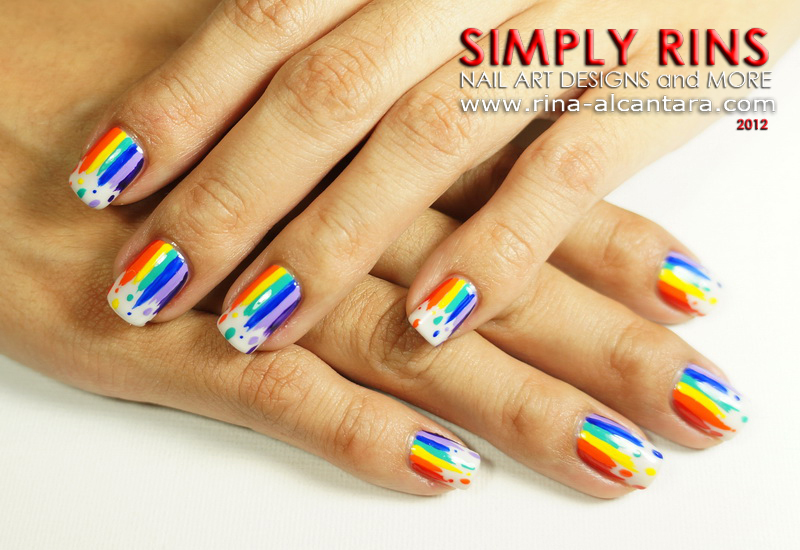 Anyway, she has been requesting a rainbow inspired nail art design ever since she found out I was into nail painting. After what seems like forever, I finally got some inspiration on how I wanted this to look like. I'm sorry it took me a very long time to create the rainbow nails that you have been requesting. I never forgotten about it. I know that this nail design has been recreated so many times and I really just wanted to come up with something different for you. I hope the wait was worth it and that you'll like what I came up with. Your outlook in life has been inspiring and the rainbow is perfect to represent your cheerful personality. I was deliberating whether to use black or white as background. The latter won. I was afraid a dark background will create a gloomy effect regardless of the colors. I opted to use China Glaze Moonlight in 3 coatings to achieve full opacity. This is a very sheer polish and I love it regardless the fact that I needed to apply 3 thin layers. It has a translucent feel to it that I really love and application is easy. I hand painted the rainbow design using acrylic paints and a detailing nail art brush. My worry about creating a rainbow inspired nail art is how I'll be separating the colors neatly and I really wanted to add a twist to it. This is when I thought of the dripping effect. It eliminated the need for perfect brush strokes and consequently, I knew that it would not be time consuming. I used the acronym ROYGBIV (red, orange, yellow, green, blue, indigo, and violet) as guide for the rainbow colors. To make it easier for me to evenly space the width of each color on my nails, I decided to start at the center using the green color, which is the center color of the rainbow. The length of each color was painted in random and I added a small blob at the end of each to create that dripping effect. I was also conscious to show some brush strokes towards the end of each color to make the drips more visible. I am quite happy with the results of this rainbow nail design. I would highly recommend this to nail art beginners. It is very easy to create because the need for perfect brush strokes is at a minimum. This makes it easy to work with your non-dominant hand since you're practically just doing one primary brush stroke, that is from the cuticle area down towards the nail tip. Yet another thing I like about this design is the fact that it creates an illusion of longer nails. 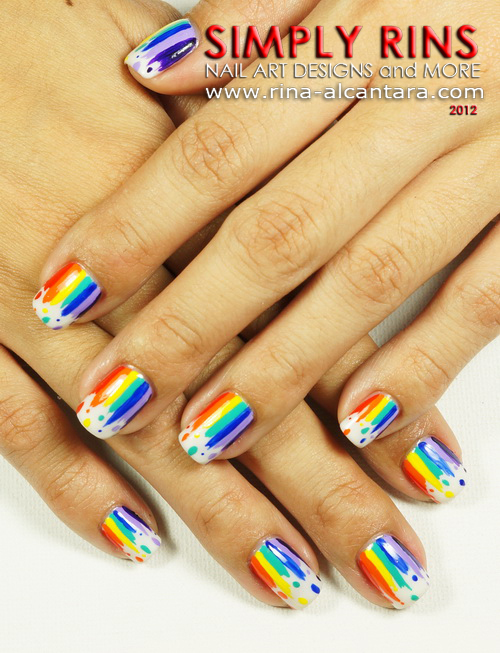 I hope my friend would forgive me for being so late to oblige to her request for rainbow inspired nail art. Oh, and I wish we could go out for dinner or coffee so I can show her my nails in person. That would be really amazing. 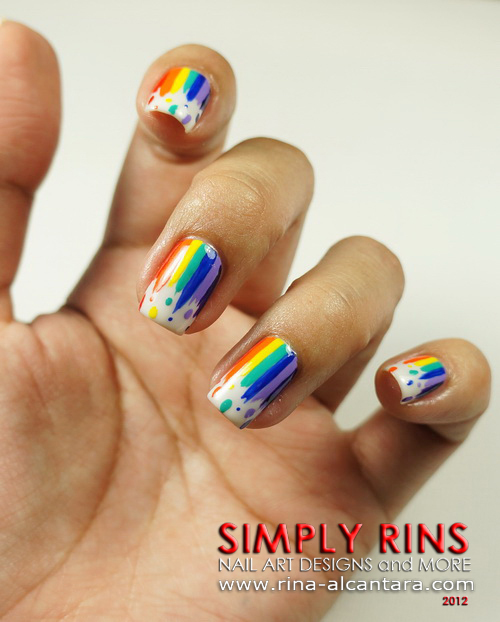 What are your thoughts on this Dripping Rainbow nail art design? I feel this would be perfect for summer. If you don't want to miss any of my nail art designs or tutorial, please subscribe here. that is beautiful! LOVE IT! Love it! I'm going to have to try this! Very cool, love the idea! Looks great! This is beautiful, I love the story behind it! I'm sure she will love it. I love this, it's very cheerful and fun. love this one !!! so gorgeous !! Wow! Very cool design! I ♥ it!! They're perfect! You're so talented! And I am so thankful! Your message reminded me to ignore the cloudy days I am now and get back to my blogging. Because everybody can use some brightness even if they're at the tip of our fingers of right smack at our work desks. You inspire me as well. I shall see you soon!!! i really appreciate your manicures. a lot of the stuff you show is so original and i love that. this is so cute! Cute!! I love dripping rainblows neva saw that before! I love rainbows! This is a great mani! You're such an awesome friend :) I used your heart patches tutorial last week & I really want to try this one out too! This is amazing :) I love rainbows, because I love colors and lots of them! And rainbows with a twist are the best ;) Very well done! It's been a week since i'm following your blog and i always ended up staring at your gallery while having an envious glances at each nail art masterpieces! You really inspired a lot of people including me! Seriously it came to a point where i saw my nails being painted by who else, YOU!! Grabe ayoko magising! that's just a dream!! hahaha! Hope you could also feature more nail art designs for shorter nails!! I have already tried doing a couple of designs but the outcome is not that good considering that i got shorter nails plus the fact that most locally made nail polish won't stay longer on my nails 'coz of my biting habit! hays! Anyway you're still my inspiration! Hi! 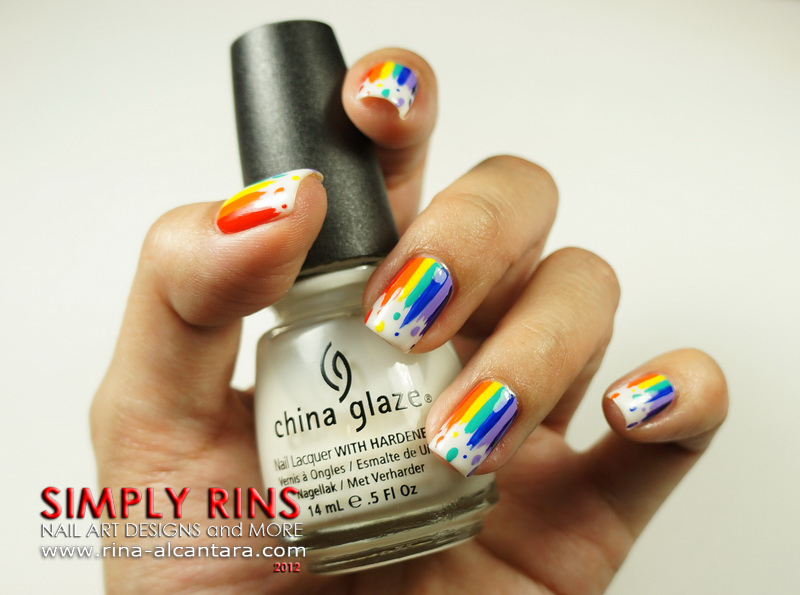 I used your tutorial and hope you will check out my rainbow mani on my blog! More power to ya!